The days of parkrunning with the warm summer sun on our backs are a distant memory! Now that the leaves have fallen from the trees, temperatures have dropped and everything just looks a little bit grey, for many parkrunners it can be tricky to know how to best prepare for Saturday mornings throughout the winter months. There may be moments when you are out in the rain, still with two more laps to go and wondering “why am I doing this? !” – but there are some really simple ways to boost your motivation before or during your parkrun. Arrange to pace a friend or meet-up with someone you haven’t seen in a while. Having a commitment can help motivate you both when the snooze button becomes tempting! Okay, so a Saturday morning parkrun is certainly not the same as an expedition across Antarctica or a climb up Mount Everest, but being organised and prepared for those particularly fresh winter mornings is always a good idea. And a spare barcode in case yours gets particularly soggy! When it’s cold outside, you might not feel obviously hot and thirsty so it can be easy to forget to drink enough water on a daily basis. But you will still sweat whilst walking, jogging and running, even on the coldest of parkrundays. Make sure you have a bottle of water handy to ensure you stay hydrated before and after your parkrun. A good tip is to leave a water bottle in your bag that you can fill up from a tap, and to help remind you to drink. What to wear for parkrun can often be a tricky question to answer, and is very much a personal choice. Some people wear tights and gloves in August, whilst others wear shorts and a t-shirt 365 days a year! You can find a range of base layers and running kit from our friends at CONTRA. Clothing comes in 10 different sizes for men and women and every single penny of profit from CONTRA goes to parkrun, to help keep parkrun free, forever, for everyone. When you arrive at your local parkrun, it’s likely you will want to catch-up and chat with friends and fellow parkrunners, but we all know standing around too long can make your feet feel like blocks of ice. On those super chilly parkrun mornings, either try to find some cover and shelter to stay out of the cold, or even better try to keep moving and walk around so that you can get your toes and muscles nice and warm ready for the pre-run briefing, and the 3, 2, 1, go! You’ve waited all week for parkrun, and it has finally arrived. The temptation can be to sprint off and start too quickly, especially on cold and wet days when you want to try and warm yourself up a bit. But when the weather is cold, it’s best to start more slowly and ease your way into your 5k, particularly for off-road parkrun courses which may be a bit muddy underfoot. Let your muscles warm-up and then finish strongly! If you think you’re cold, the chances are the thousands of parkrun volunteers might be even colder! 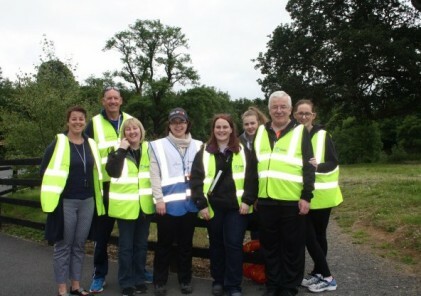 Whilst parkruns across Ireland start at 9:30am, the time required to inspect and set-up the course and the finish area means most volunteers will have arrived long before most other parkrunners have set-off on their journeys, and on top of that the equipment and signs then need to be packed away and stored afterwards. 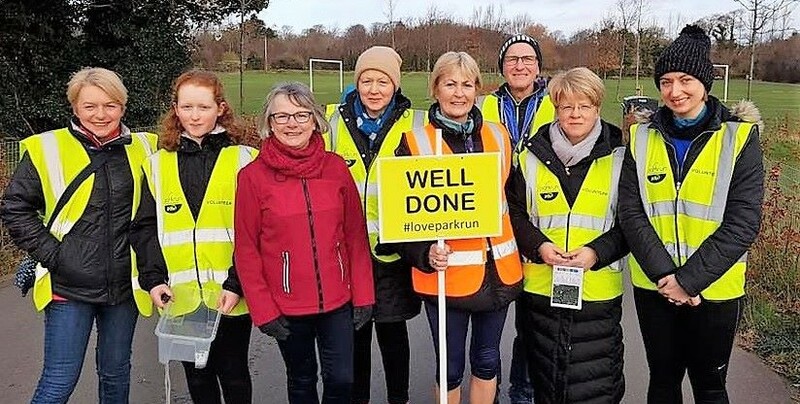 There are undoubtedly countless benefits to volunteering at parkrun, but as a volunteer, nothing warms the heart and soul more than receiving thanks, so be sure to say a big “Thank you” to your local hi-vis heroes. You’ve done it! You dragged yourself out of bed in the galeforce winds, driving rain, freezing cold and snowy blizzard (okay we may be exaggerating a bit!) and you are now one parkrun closer to your next milestone t-shirt. The temptation can be to bask in the post-parkrun glow, but it’s really important to make sure you put something warm on as quickly as you can once you have finished and had your barcode scanned, especially on wet days when your clothes are damp or sweaty. Having a warm jacket, hoody, tights or sweatpants to wear after parkrun in the cafe, or on your journey home, are invaluable ways to stay warm. If in doubt as to how many layers you’ll need, it’s always best to have one more than you think. You can find a range of cold weather kit available from CONTRA here. The highlight of the week for lots of people is socialising in the cafe after parkrun – especially if you’re sorting the finish tokens, and never is the post-parkrun cafe more appealing than on a damp, freezing Saturday morning in early February! Having a cup of something hot after your parkrun on a cold day is a brilliant way to warm yourself up, especially if you forgot to bring your gloves… And if your local parkrun doesn’t have a cafe nearby, you could always be ultra-prepared and take a flask with you. Having read all of the information and advice above, you might be thinking this all sounds like a lot to bring and remember. But parkrun is not a race, and there is always next week. Ultimately you can wear whatever you want, and everyone is welcome at parkrun. Just enjoy the fact you are up on a Saturday morning, in the great outdoors, being physically active and socialising, getting all the physical and mental health benefits that go with it. And most importantly, you are now one week closer to spring and summer.